The total number of tourist arrivals to Macau from February 15 to February 18 inclusive rose by 10.0 percent compared to the equivalent period of Chinese New Year in 2017. The total tally stood at 500,404, according to figures reported by the Macao Government Tourism Office. The first day of the current Chinese New Year fell on February 16 (Friday). A total of 70.8 percent of the arrivals in the period – amounting to 354,047 instances – were by visitors from mainland China, representing a year-on-year increase of 18.5 percent for that group. The figures were recorded by Macau’s Public Security Police, and measured the number of tourists passing through border checkpoints around the city. The Chinese New Year period is usually a peak season for Macau’s gaming industry as hundreds of thousands of mainland Chinese tourists take advantage of the week-long break to visit the city. Investment analysts however have noted in previous commentary on Macau that there need not be a direct correlation between numbers of tourists to Macau and gaming spend in casinos. This is because research indicates that high-stakes play by a relatively small number of visitors is still an important component of the market. Nonetheless, investors like to track Macau’s visitor numbers and gross gaming revenue (GGR) performance during Chinese New Year, for clues to possible trends in the rest of the calendar year. 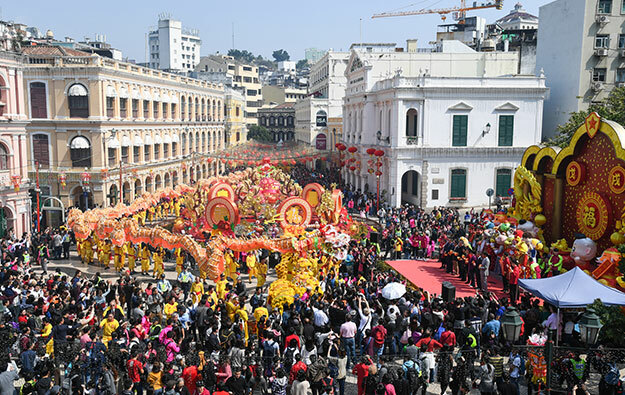 Maria Helena de Senna Fernandes, the head of the Macao Government Tourism Office, forecast last week that the number of tourists visiting Macau during the Chinese New Year holiday period would “increase in the range of 1 percent to 3 percent” compared to the equivalent period in 2017.